Earthless are preparing to return with a new album, Black Heaven, on March 16th. 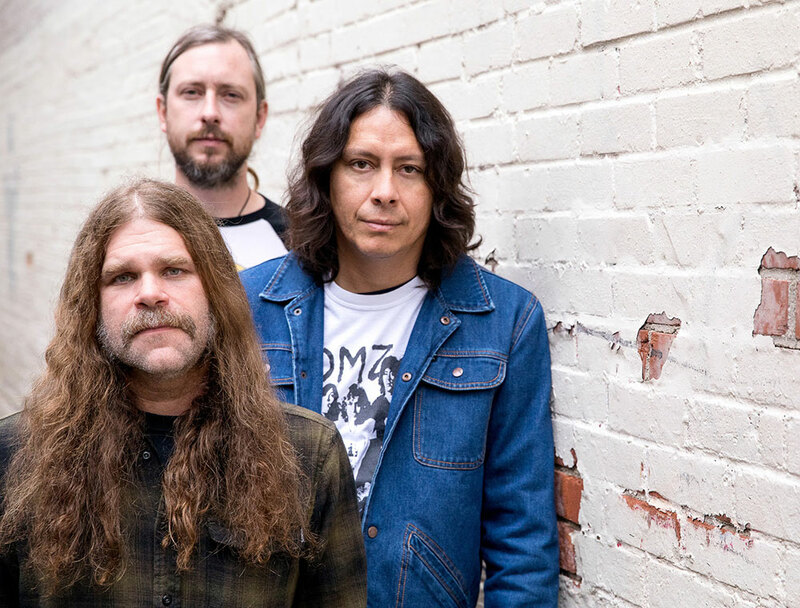 Black Heaven is the first Earthless record to include vocals on the majority of its songs – a signal that this band is always willing to push the boundaries of its cosmic compositions. The album was recorded at the renowned Joshua Tree studio Rancho de la Luna, home of producer Dave Catching (Eagles of Death Metal). 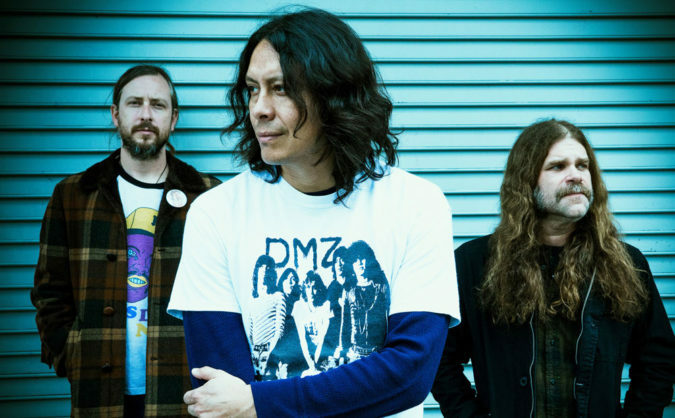 Earthless are drummer Mario Rubalcaba, guitarist/vocalist Isaiah Mitchell, and bass player Mike Eginton. Dan Redding: What was the discovery process around bringing vocals to Earthless for Black Heaven? Mario Rubalcaba: We didn’t know we were gonna have so many songs with vocals on them. We thought we were gonna have maybe two songs with vocals at first. Those were some of the first things that Isaiah had sent over via email, these riffs. But then we ended up with two more that had vocals. We were kinda surprised at the end that we had four songs with vocals and only two that were instrumental. It just kinda worked out that way. Do you guys have an open-minded willingness to try new things in general? Yeah – we don’t try to force it though. I think that’s one of the things that we like about our band: we’ll know right away if something doesn’t feel right. If we have to work at something too hard, then it’s just kind of a bummer. So if everyone’s on board with a sound or a vibe, then we just kinda go with it as long as we’re having fun. We felt like the last record really made a statement: having a thirty-one minute long instrumental song (‘From The Ages’). That wasn’t something we wanted to repeat. I don’t think – even if we wanted to – that we would’ve had the time to make something like that. We just didn’t want to repeat that thing that we just did. We were sort of all on the same wavelength to make something totally different this time. We’ve always known Isaiah could sing, but we never really focused on writing songs per se. It was refreshing to do that. Vocals aside, how else do you feel that Earthless evolved from the previous album to this one? I think Black Heaven has a little bit more of a high-energy sharpness to it. Also, I think a little bit more of our classic rock roots are showing up here. The earlier albums were more based on Krautrock and the Japanese blues stuff that we’re really into. We grew up with ZZ Top, James Gang, Led Zeppelin – stuff like that. I think a little more of that is showing its colors here. What do you think is important or special about the format of power trio rock bands, and what do you think it’s important for a power trio to be good at? Just paying attention to your bandmates, you know? Really listening to everything that’s going on besides just what you’re doing, or becoming absorbed in your own little world. It’s about listening to the whole of the band – bass, guitar, vocals. Not every power trio is an improvisational scenario, but there’s a certain kind of magic there, if it’s done right. There’s obviously some good examples from history. What kind of inspiration did you feel at Rancho De La Luna, or from the surrounding environment of Joshua Tree itself? It was cool. The environment of the studio is really cool, because it’s a house; it’s not a real proper recording studio – it’s just Dave’s house. The console is in the living room. In his bedroom, every wall is surrounded by guitar amps. There’s a little hallway closet – that’s where the bass cabinets were isolated. The drums were in this other room – what might be a guest room or something. It just had a comforting good vibe with good equipment, you know? Also, being able to stay there for a whole week and really live the whole process was really fun. All you had to do was focus on the music. There’s a little house where all the bands stay on the property. We would make food at the house. There’s a little stereo with a bunch of records. We’d just listen to tunes outside. Having that time at night to hang out as a band was really important as well. It helped shape some ideas while we were there. It also influenced the title of Black Heaven. We’d record in the studio until maybe ten or eleven at night. Then we’d head back up to the guest house and put records on and make some food, hang out outside. Just looking up at the stars in the desert is pretty unique. You can see everything. It’s super black, and you can see all the little galaxies. If I were to ask you what’s your most memorable studio session, what pops into your head? I know you’ve been in a lot of bands. I’m trying to think of the last twenty-five years (laughter) … I’m gonna just say, really, out of all the years of doing this, this most recent experience was probably the coolest. Like I said before, we got to live there for a whole week and be immersed in the project one hundred percent. Whereas usually, you go to a studio and record, and later on you go back home or you go to a hotel or whatever. This was unique in the sense that it was all we had to think about for a whole week. I know that Ross Robinson has a similar setup of a home studio environment – is that an uncommon kind of setup? I think it’s starting to become a bit more common, just because of the convenience of ProTools and stuff like that. People are making the best of both worlds. You don’t always have to have a room that’s built by sound designers. You can make something out of a closet. People can make a bedroom into something that sounds decent these days. What album do you think you’ve listened to more than any other album? Probably Led Zeppelin IV… Any Led Zeppelin record really; IV or the first Led Zeppelin album. I played those millions of times since I was a kid. Same with Black Sabbath. What is an attribute or skill of John Bonham’s that you’ve always appreciated? Dynamics. The color and shade aspect. It’s not just about playing loud and hitting hard the whole time. He could lighten it up or he could really lay in if he wanted to throw in some busy stuff, or some technical chops. He had that, but that wasn’t what was important in his playing. He just knew how to make the song feel good, to play with the song and add to its story or its emotion. I think that’s why his playing stands the test of time. It helps convey the story of the music. That’s what stands out to me. Yeah, and that connects to what you said before about listening to your bandmates.